Scene from a Zine display. 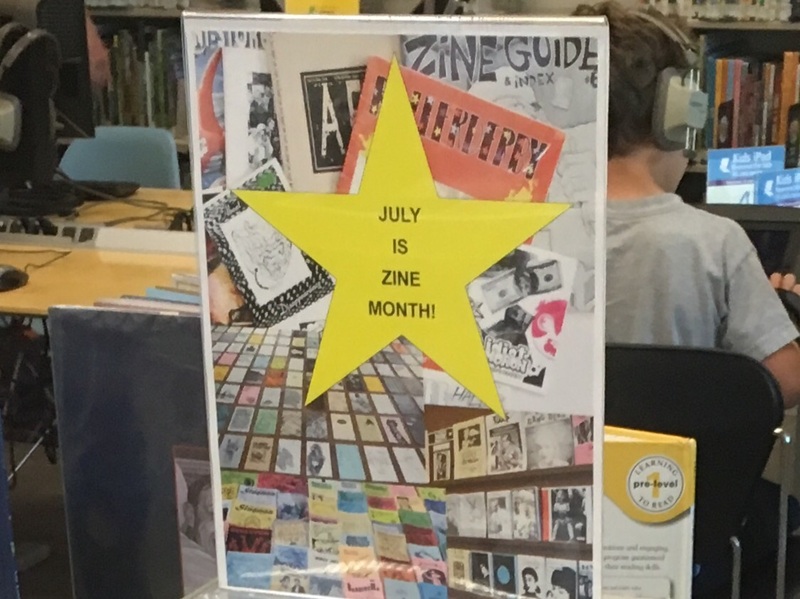 Imagine my surprise seeing a display declaring July to be Zine Month at my local library. I didn’t know. I snapped up a few of the zines and had to tidy up the display. 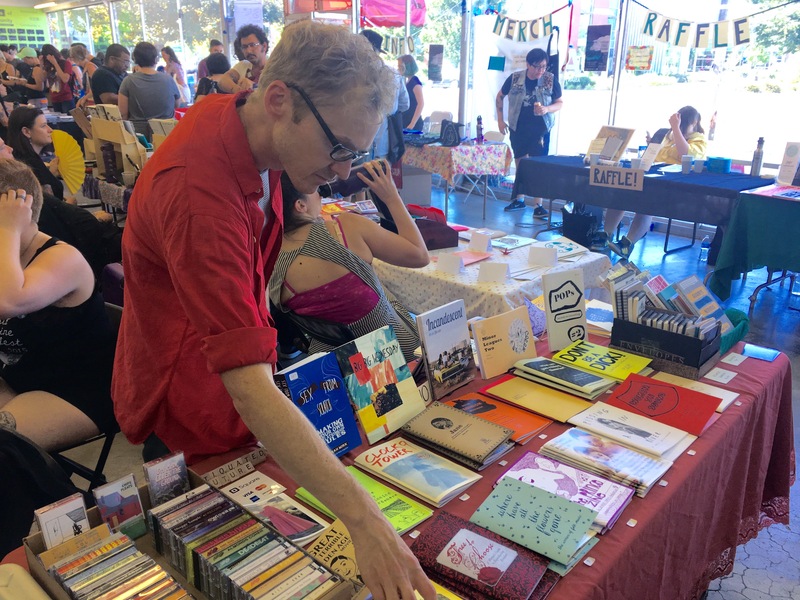 Zines had been off my radar, but I was reminded the library offers small press publications for checkout in five of its branches including Albina, Belmont, Central, Hollywood and North Portland. With a title in mind, you can use the online system to place a hold on the and pick it up at your local branch. I collected zines in the 90’s. They’ve ended up in a box in the basement labeled “small press publications.” Inside the box are zines with reviews of my musical releases, publications I appreciated (usually by people I ended up corresponding with) and a complete set of Mole Magazine, a zine I contributed to. Mole publisher, Jeff Bagato, did the heavy lifting. I submitted articles, wrote music reviews and participated in collating parties. Yes, July is Zine Month! During Zine Month, I noticed a poster in the window of my local coffee shop advertising the Portland Zine Symposium. I made plans to attend. Before heading out to the Zine Symposium, I considered what a blogger’s convention would be like imaging an uncluttered space with people gathered around computer screens looking at each other’s work. Walking toward the meeting space in the Jade Market District, the first person I encountered was someone I knew. Matt Dan was sitting on a curb, taking a break from the hot crowded space. I knew him from his time as an animator screening work at a monthly event called “Attack of the Flicks.” He was there with his collaborators called Night Time Science who produce comic books. Site of this year’s Symposium. Soon I felt like I was in a spinning kaleidoscope. The printed word, illustrations and people’s voices swirled around me. I circled tables, stopping to look through the materials. The symposium was hopping. I thought if I arrived late on the second day people would be packing up and the crowd would be thinning. At one table I paused to look at an illustration of Margaret Dumont in a zine about movies from the 30’s. This started a conversation with zine distributor Joshua James Amberson about the actress and whether she was in on the joke about being the repressed foil to the Marx Brother’s in many of their movies. Joshua runs Antiquated Future and publishes a zine called Basic Paper Airplane and a Prince tribute publication. He told me that zines are as popular as ever because the internet has created the kind of word of mouth that keeps people interested. He stays busy filling orders a few times a week and paying zine makers with a system he’s developed over the years. I wish I’d been recording because I was getting a great overview about the current state of the zine world from an avid participant but he did mention some intriguing thoughts about what he’d learned as a publisher. He’s noticed the importance of titles in deciding the popularity of a publication explaining these days they needed to be specific in their descriptions of the zine’s content which he said wasn’t as important in the 90’s. Some of Antiquated Future’s wares. Joshua slipped me a copy of Basic Paper Airplane which I read days later along with a hand colored one sheet zine that someone else had handed me. Both amazed me. The latter described the plight of bees and mentioned things I could do to keep them healthy. This was an inspiring piece of paper. Joshua’s zine focused on personal stories of his work history and being a writer. It made me realize how interested I was in the memoir. The personal stories jumped out at me at the Zine Symposium whether about someone trying to sell a house or dedicated to chronic pain and sporting a elaborate cover. Don’t go killing all the bees. I caught up with Matt Dan inside the meeting place and learned he was promoting a comic he worked on which is set in Beaverton. He explained he chose Beaverton because “there’s no cultural coverage there.” He talked about how he transitioned away from animation due to the expense and time consuming nature of it. But any art form takes time as he acknowledged the months of effort it took to create a comic book. I talked to another person behind a table. She pointed out the award winning book by Martha Grover. 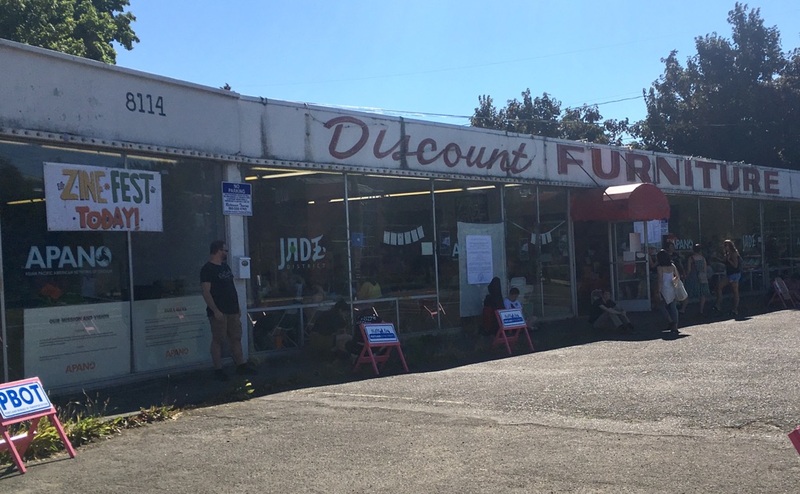 My attention was drawn to a zine by this author about the Fred Meyer grocery chain. I had a zines worth of information at my fingertips. The three dollar price was too high. I consoled myself by thinking that I already knew that Leo DiCaprio had once been in a Fred Meyer TV ad. At this table I was given a flyer for the Olympia Zine Fair. The woman told me that Olympia was like Portland only two hours away. 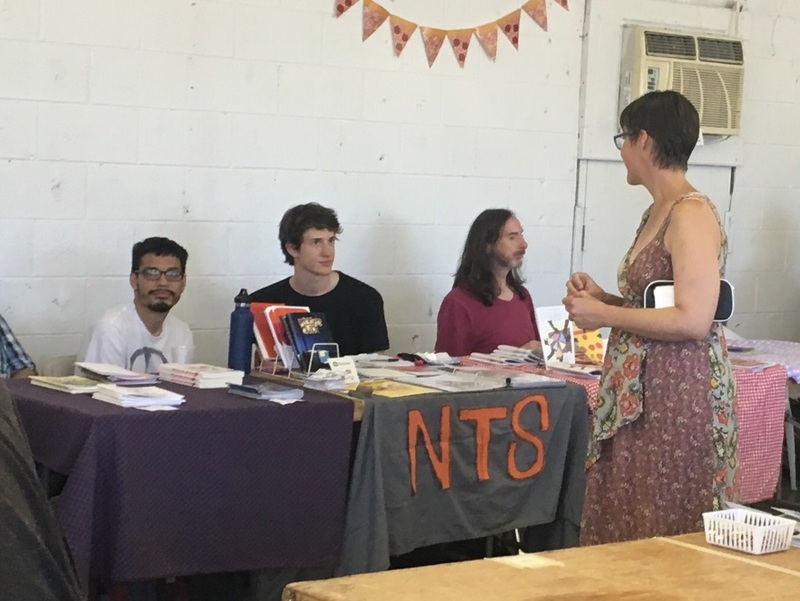 I walked away having learned two things: If you go to a Zine Symposium don’t be broke, bring cash and make an effort to meet people who are friendly and interesting. The roar of the masses. 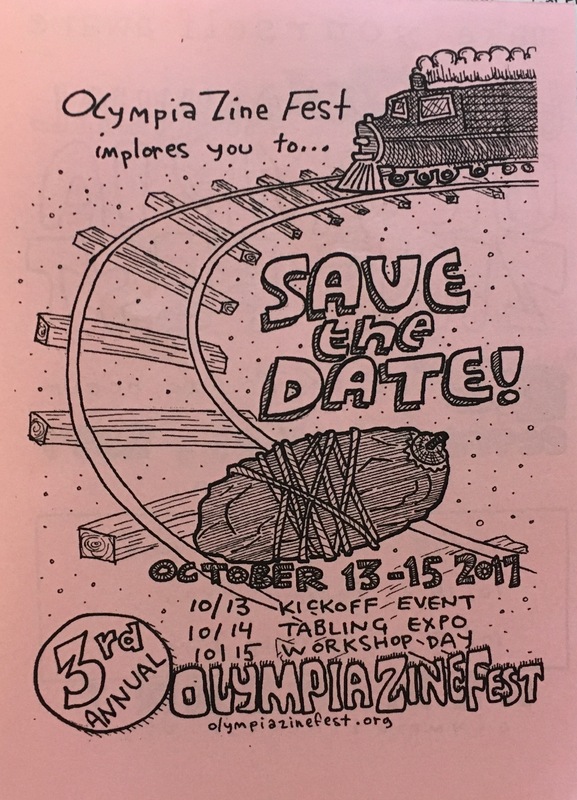 It makes sense that the Zine Symposium is held during Zine month. I had to find out more about Zine month so I contacted Lori Moore, a regional librarian with Multnomah County. Lori and I have a history that goes back a few years to my effort to donate those Mole magazines I’d helped with in the 90’s. Lori told me that the library didn’t create Zine Month. She believes that credit goes to Alex Wrekk, who, from what I could gather, has organized Zine Symposiums. 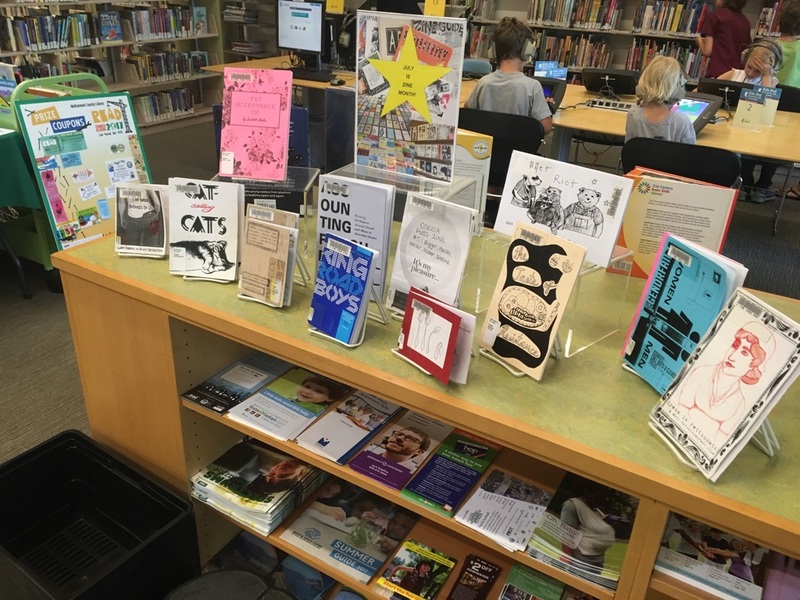 Zine Month promotes our county’s zine collection. I was curious about current zines so I asked for recommendations. Lori suggested They Call Us Viet Kieu, the Prince Zine, the Women of Color (WOC) collection, and Hari Kondabolu Interviewed. 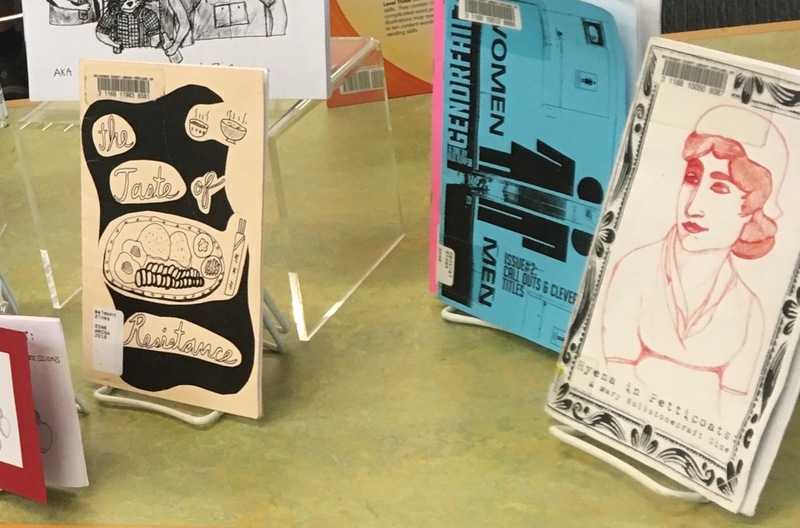 The library’s website also mentions a Zine exchange program whereby donated zines, not a part of the library’s collection, can be picked up or dropped off to be kept or returned for some one else to read. It’s a safe bet you’ll find the Zine Exchange boxes at the library branches with zine sections. My apologies for reporting so late, at the end of Zine Month. But zines aren’t going anywhere. 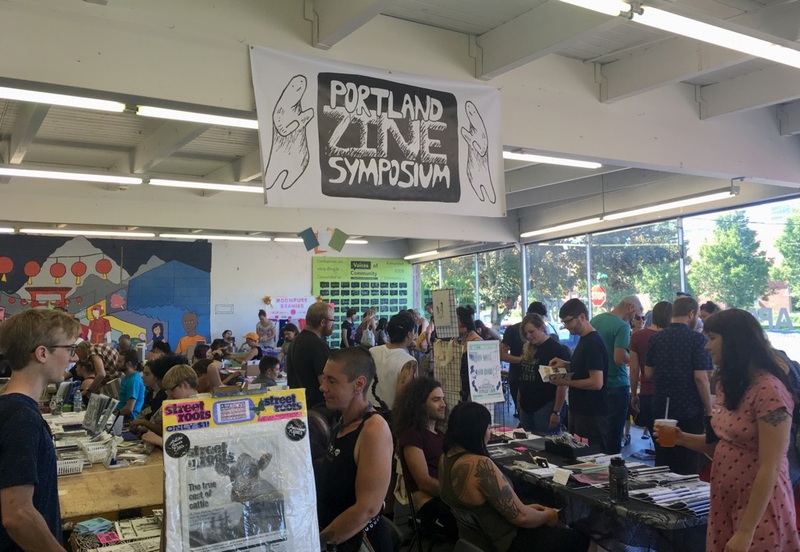 You can catch the Olympia Zine Fair or browse through zines at library branches that have them. 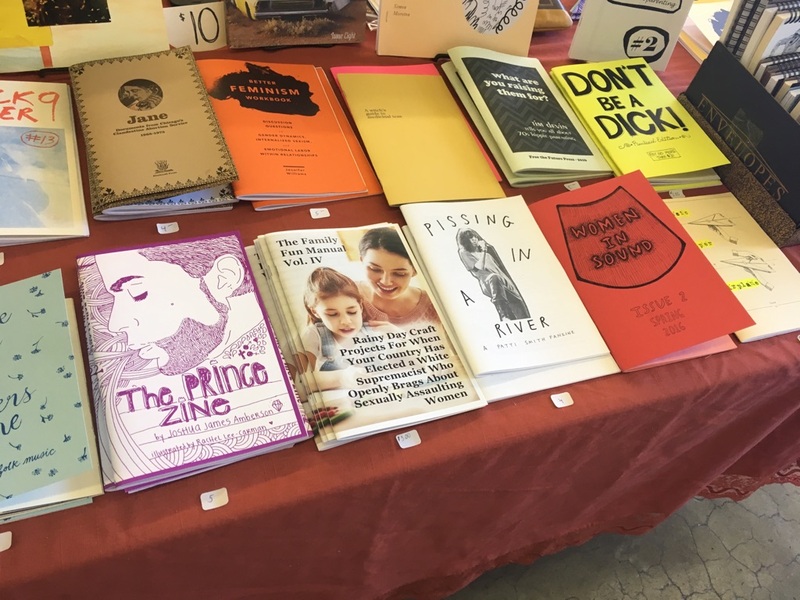 The IPRC looks like great local resource if you’re thinking about making your own zine. I was trying to relate to how things may have been different in my day but I realized things haven’t changed much. People are still looking for ways to showcase their creativity. I like the tangible qualities of paper that’s flexible, portable and perfect for hoarding. I’m only wary of accumulating more zines because I don’t need another box of stuff in the basement for the next fifty years. If anyone wants 25 boxes of zines from the 90s, they should contact me. I need to unload my collection. 25 boxes, 25 boxes, don’t even tell me what size they are. I managed to get the small press stuff into a couple of boxes, I think. DC don’t forget you also contributed financially to Mole, as well as handled the post office box for a while. Remember the time The Herndon newspaper did a story on zines, focusing on us? The reporter couldn’t believe we wore suits! Good times. I remember fondly that brief time in my life when I was flush with cash and I could be generous. I remember that reporter (RIP). She was about as befuddled with our youth as I’m starting to get with today’s youth. If anyone wants back issues of Mole, just let me know.